My ideas are always clear. »If you can design one thing, you can design everything.« The Italian architect and designer Lella Vignelli has turned her hand to every kind of project, from furniture, interiors, showrooms and exhibitions to product design, silverware and clothing. In the beginning of the 1960s she established the Vignelli Office of Design and Architecture in Milan together with her husband Massimo Vignelli. In the end of the decade the pair settled in New York and launched one of the world’s biggest design firms at the time, Unimark International. 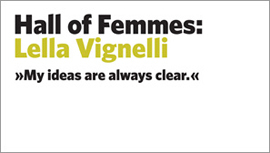 Lella Vignelli received AIGA’s Gold Medal in 1983. Hall of Femmes: Lella Vignelli includes an introductionary essay by Martha Scotford, Professor of Graphic Design and author of Cipe Pineles: a Life of Design. It is richly illustrated, much of it never before published.